It is not often that such a theme emerges on WordPress. X is a very well-designed and efficient product. It is a pioneer and a record breaker, as X is the most popular WordPress product that offers multiple designs and concepts. Included in one bundle, users can enjoy 4 unique designs called stacks. X offers a large package of features, greatly increasing its versatility and value. It does not matter which web browser your users prefer, as this theme will work on all of them. Some extensive documentation is included, offering a vast amount of information to anyone that is willing to read it. If any issues emerge, the support staff is eagerly awaiting your request. Themeco has a dozen dedicated and hard-working representatives that are available full time. These driven individuals aim to further develop and support the product. With X, the customer is getting a bang for his buck. A large amount of plugins were added free of charge, included in the standard download. These are not regular plugins that were offered for the sake of bloating the theme’s feature list, but custom made extensions that were specifically designed to operate with X. If Envato is to be believed, X has broken all WordPress sales records. It won the title of fastest selling theme. It is so good, that the state government of Utah has commissioned its own copies, with more orders to come in the future. X has irrevocably changed the WordPress landscape, raising the bar for all future products. 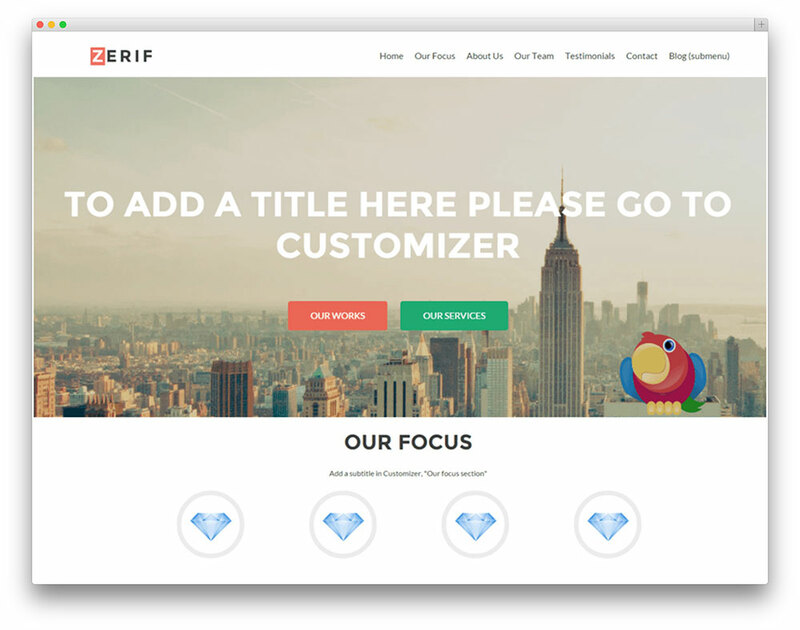 If you are looking for a clean, modern and professional WordPress business theme then Zerif PRO is your right choice. This theme comes with awesome parallax scrolling for various sections of your website as well as smooth CSS3 animations that makes your content to appear with style. Zerif PRO theme is SEO friendly and that should help with traffic from search engines. The theme comes with several custom widgets, page layouts and everything else to create website for any kind of business. Kalium is an excellent WordPress theme that is intended for blogging and portfolio websites. It has plenty of layout design variations, along with an impressive drag and drop content builder. There are many features and elements, each designed to enhance your website and guarantee its success. 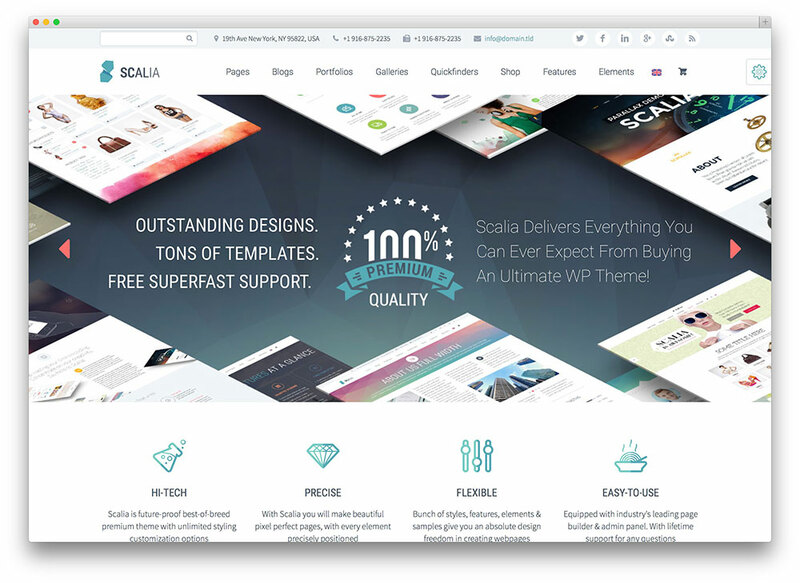 In just its first month, Kalium was downloaded over 600 times, making it the new fastest selling WordPress theme on the market. It has received several prestigious awards, including the CSS Design Award in April 2015. This theme is set to include its own online shop, which will be added with future updates. Users will be able to commercialize their services and items, taking advantage of a stable and reliable platform. Currently, customers can benefit from a $10 price discount. In addition, those who purchase Kalium now, will benefit from a series of free updates. Given the staggering amount of useful features, the price is very reasonable. The impressive Visual Composer was added, free of charge. It is a premium plugin which would normally cost $28. This allows users to easily construct their pages in a matter of minutes. With Kalium, your future website will benefit from multilingual support. This is due to the inclusion of the versatile WPML plugin, along with .po and .mo files. A translatable page is more likely to attract visitors, making your content more accessible. Every single element has its own specific short code, as customers can implement it on any page. For more information regarding this topic, be sure to consult the extensive theme documentation. Kalium offers a live preview, along with some interesting screenshots. The Revolution slider was incorporated, offering a multi-purpose Slider Display system. You can now showcase your content in a streamlined and efficient manner, proving to your potential clients that you are worthy of their consideration. 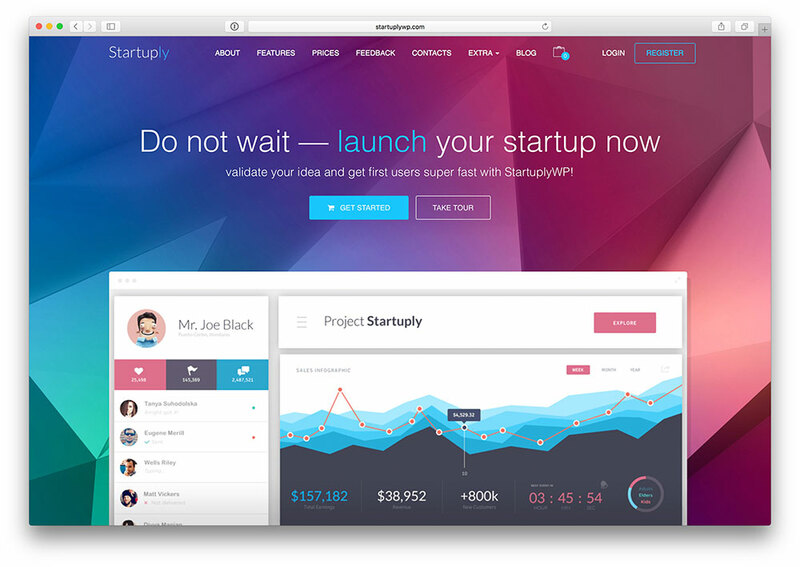 Startuply Landing Page is a potent multi-purpose template page for WordPress based websites, ideally suited for established or developed businesses serving very different needs to their demographic. It is also convenient for startup project websites, as well as product or event launch websites. A Startuply Landing Page is a feat of multipurposed ingenuity, and a paragon of versatility in web design. An impressively well documented guide prepares the webmaster for expert use of its native shortcodes, nifty little tools that enable the effortless creation of anything from image galleries, product pricing & feature tables, registration forms, order forms, tabbed views of content, accordion nesting content, social media sharing platforms, and so much more, the only limit is exactly how imaginative the webmaster can be! Asides from these useful preprogrammed shortcodes, Startuply Landing Page is designed to be radically responsive to user device preference, adapting your content’s displayed layout to best suit the user’s screen (and screen orientation, as cases may be). Compatibility with all modern browsers is, as a result, included, as are all possible screen ratios. Finally, native Bootstrap 3, CSS3 and HTML5 compatibility make Startuply Landing Pages prepared for the future of the Internet, and ensure your business will look current and tech-savvy for years to come. Dastak is a professional multipurpose WordPress theme well suited for any small or medium size business in any niche. This theme features 25 different demos that showcases its potential to be used for medical, construction company, portfolio, ecommerce, IT, social media and many other business websites. This theme was created by professional team which is behind many best-selling WordPress themes in various niches. While this theme has loads of options and complex structure it is still SEO friendly that will help you to get more visitors from search engines such as Google. Dastak theme comes with bundled Revolution Slider and Royal Slider plugins that will help you to create professional looking slider with multiple layers and other premium enhancements. Theme developers haven’t forgot about drag & drop page builder called Visual Composer which is also included with this theme and has over 100 different modules that will help you to create awesome functionality for your website without writing a single line of code. 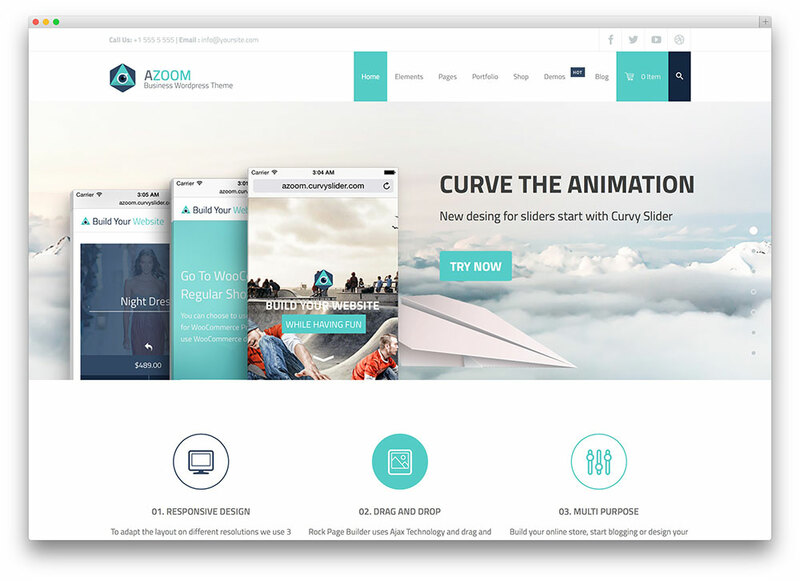 Azoom is a unique and refreshing WordPress theme, designed for those who value quality and consistency. It offers a massive roster of features, implemented in order to improve and complement any website. There are Special Grids, which can be used to configure Parallax video backgrounds and other impressive elements. Both visually impressive and highly functional, Azoom is a theme that is definitely worth your consideration. With this product, your web page will be completely responsive. Three distinct break points are used for different devices. Fluid elements and grids will always adjust to the size of the user’s display. In addition, this theme is compatible with one of the most popular plugins of WordPress: WooCommerce. It allows you to create a personal online store which can be used to commercialize products and services. Every product page can be crafted using the Rock Page Builder. If you want to save time, you can select the One Click Demo importer. As its name suggests, it lets customers select a demo version and import it to the site. Page administrators can choose any width for the layout. It requires no code modification, making it more accessible to users who lack programming knowledge. Simply input the desired size in the Theme Options, and you’re good to go! 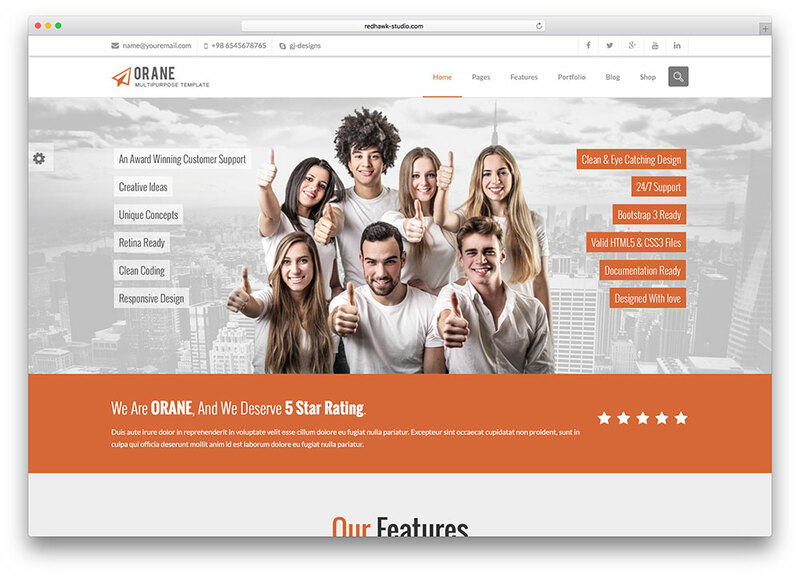 Orane is an evolutionary multi-purpose WordPress website theme that delivers many retina ready design features from 3D sliders to Visual Composers to High Definition images and a clear and functional layout. A live preview and screenshots show what a professional looking site can be made with it. Detailed documentation, 24/7 support and video guides help you along the way. It is expertly designed to meet all your needs while making it both flexible and easily usable. They are regularly updating it and the latest version is impressive. Orane’s unique look lets your site stand out from the others. You can shape it to suit your purposes with many features, options, fonts and colors. Its 6 homepage variations offer something for everyone and are adaptable to your needs. It has many elements you can drag into place quickly and effortlessly. It is compatible across all browsers and devices and is optimised for search engines. Orane is highly customizable and easy to use to tweak every aspect of your site. It is suited to creative sites like designers and photo studios and also businesses and freelancers to showcase their work. It comes with a core plugin that makes it easy to change theme without losing content. 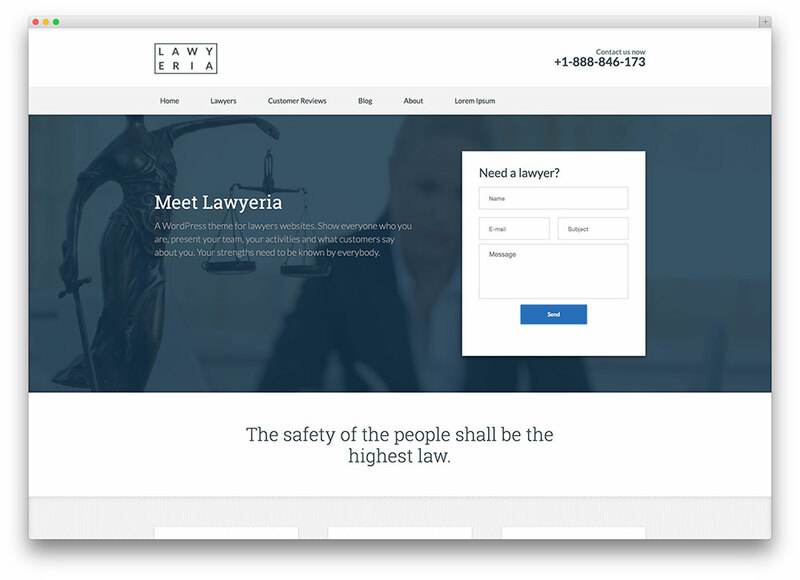 Lawyeria WordPress Theme is an ideal solution for a private attorney website as well as for any size law firm websites. It includes all the necessary functionality to showcase our services online. This theme is great to showcase attorney personal profiles as well as your company in general. Lawyeria theme is a well coded WordPress theme that makes it SEO friendly and optimized for fast loading on any device. The theme is fully responsive and will look awesome on any device such as smartphones and tablets. This theme is best suited for law firms but it can be used for any business website. 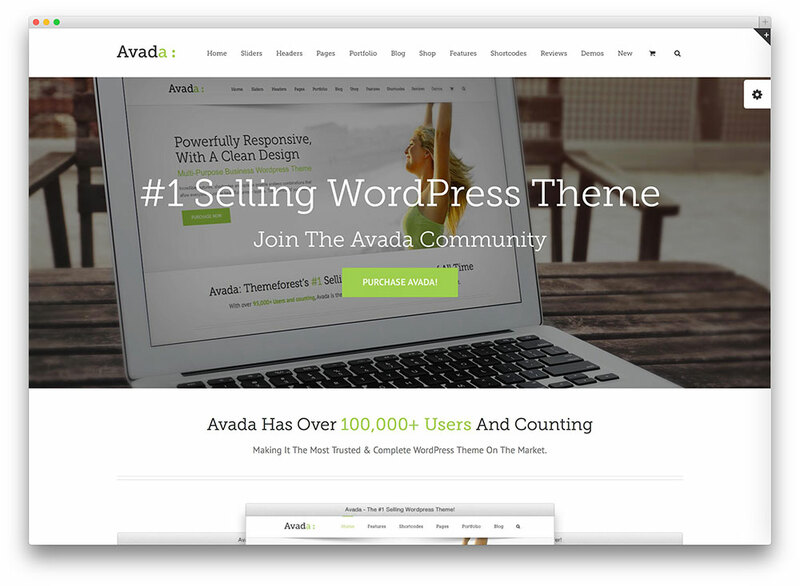 Avada is a clean and fully responsive WordPress business theme. Each element of this super flexible theme is retina-ready and would look spectacular on high resolution screens. This theme is easy to use and equipped with the most powerful theme features. It is fully customizable and comes with gorgeous pre-built layouts. Its flexible framework allows you to build a decent website for business, portfolio, blog, magazine, ecommerce and more. Its advanced admin panel helps users customize the theme with ease. You can also make the most of it one page parallax feature to create an attractive and elegant one page site for your company. Avada is built based on HTML5 & CSS3 technology. What’s more, this responsive theme is 100% WooCommerce compatible and supports bbPress plugin. Avada simply redefines the word AWESOME! 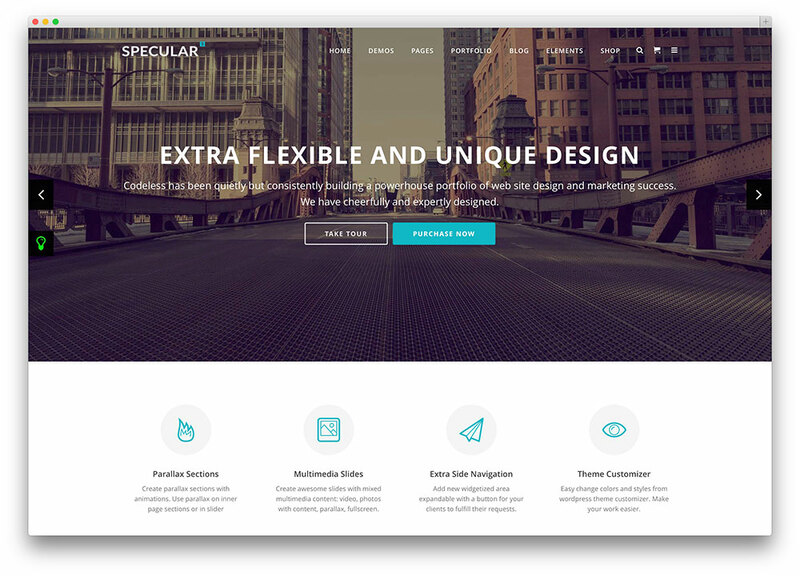 Spectacular is an impressive WordPress business theme. One of its most impressive features is that it lets you sample the content by trying the demos. In addition, you may interact with the demo and personalize it, without spending a single dime. Currently, there are over 28 of these templates available. If you ever encounter something that seems unfamiliar, be sure to consult the theme documentation. It is well-written, informative, and obtainable for free. Should problems arise, the Support Forum is ready to receive your question. Regardless of what issue you are experiencing, do not hesitate to go to the forum. The support representatives are eager to help all customers. If you do not have the time to read the Documentation, there are video tutorials and presentations on the theme’s website. If someone attempts to resize your page, its visual quality will not deteriorate. It does not matter if you are using a mobile phone, tablet, or laptop, the image will still look sharp. This theme’s fluidity is very impressive. It boasts a large roster of features, preparing it for every conceivable business niche. Be it a medical private practice, photography, construction, or restaurant website, Spectacular is on your side. This product is very user friendly. It is kept simple and approachable, as even a child can create a spectacular web page. The Theme Options do not require any coding knowledge. You only need to click and select whatever options fit your vision. Specular incorporates a full width creative blog style as well. 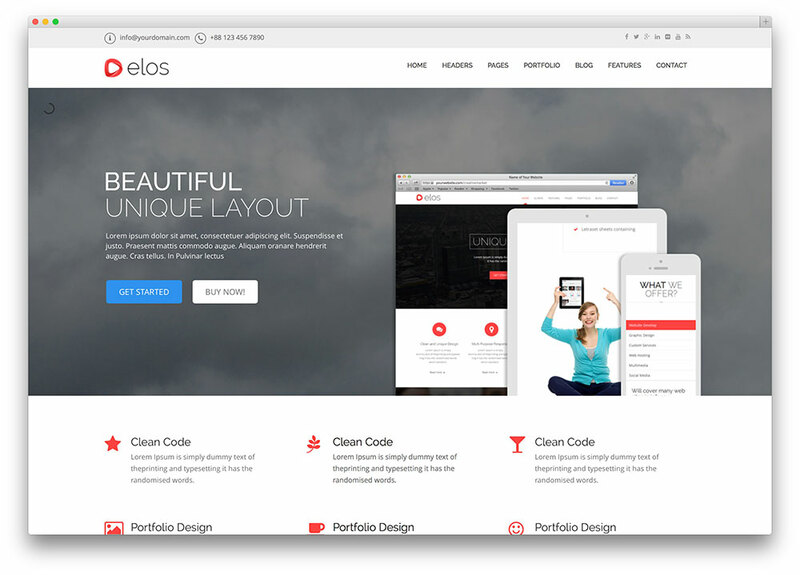 If you are looking for a versatile WordPress theme, look no further than Elos. This is a very impressive product, as it is packed with useful features. All of the complicated elements of building a website have been simplified, and made accessible to anyone. For example, the Visual Composer makes customizing a page seem like a walk in the park. It doesn’t matter if you are new to WordPress, because Elos does not require you to be tech savvy. It is always nice to have a business website with WPML support. This makes your text lines translatable, thus more accessible to potential clients. Elos incorporates plenty of Shortcodes, and it is ready for high definition Retina displays. There are 10 different layouts to choose from, along with 5 distinct footer variations. There are over 50 feature selections offered. You can make so many choices, and alter so many elements of your site. In the end, you will have a page that reflects your business vision. Elos is Widget Ready, and it is compatible with many web browsers: Firefox, Safari, Opera, Chrome, IE8, IE9, IE10, IE11. Currently, the theme was downloaded over 560 times, and it has earned an average rating of 4.60 stars. It seems that the reception from the community was overall positive, as user praised this theme’s quality design and exemplary customer support. If you want to see some of the content without spending a dime, be sure to check out the screenshots on the site, along with the live preview. 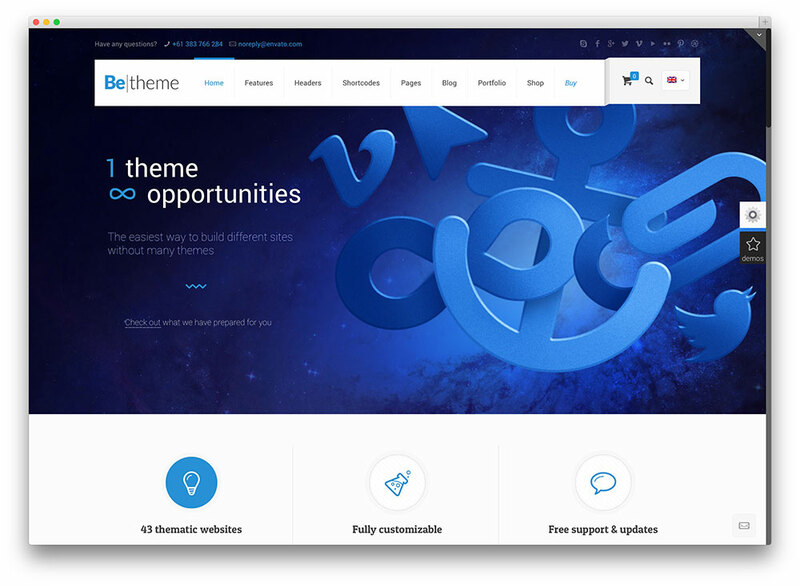 Edge out your competitors with BeTheme business theme! This feature-rich website framework has everything a web designer needs to develop an outstanding business website. BeTheme gives you an option to get rid of the superfluous background images on inner pages. 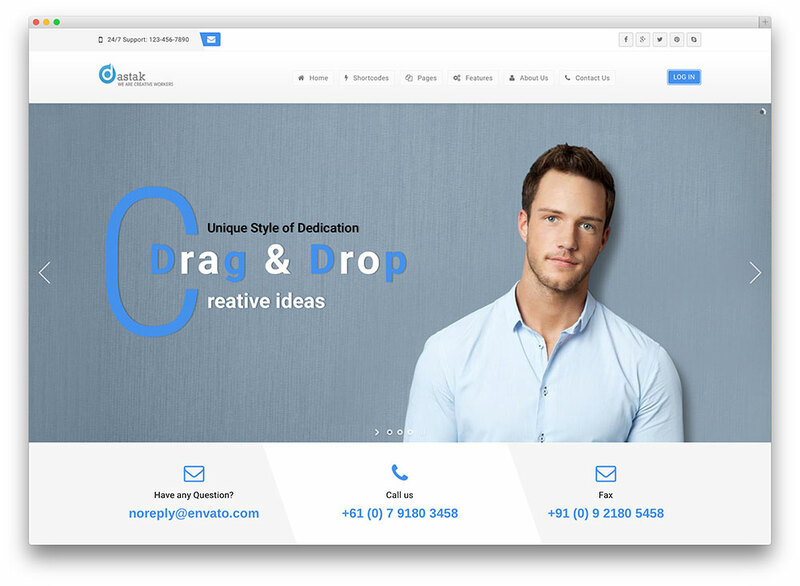 You can also use the parallax effect to jazz up your website and create a tasteful business website. This incredible functionality helps you attract more site visitors without compromising the responsiveness and usability of your website. 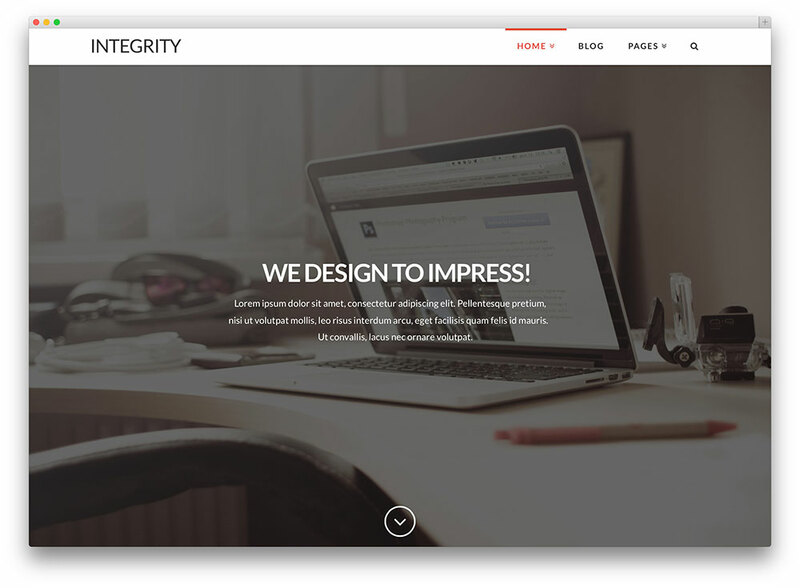 With BeTheme, you are able to build a striking one page website. The integration of Drag&Drop Muffin Builder feature in this theme is a huge help for many website admin who detest working with text shortcodes. It also incorporates astonishing entry animation effects on scroll. It enables you to display a maintenance mode page in case your website is not yet ready to show up or going through a major redesign. This theme also supports WooCommerce plugin, which has the ability to transform your site to a profitable online store. Atrium is a fully responsive and clean one page WordPress theme ideal for corporate websites. The theme provides a minimalist design with a strong color accents. Every aspect of this theme is fully responsive to ensure that it will work slickly on any mobile device. With its powerful drag and drop page builder, you’re able to build an inimitable business website right away. 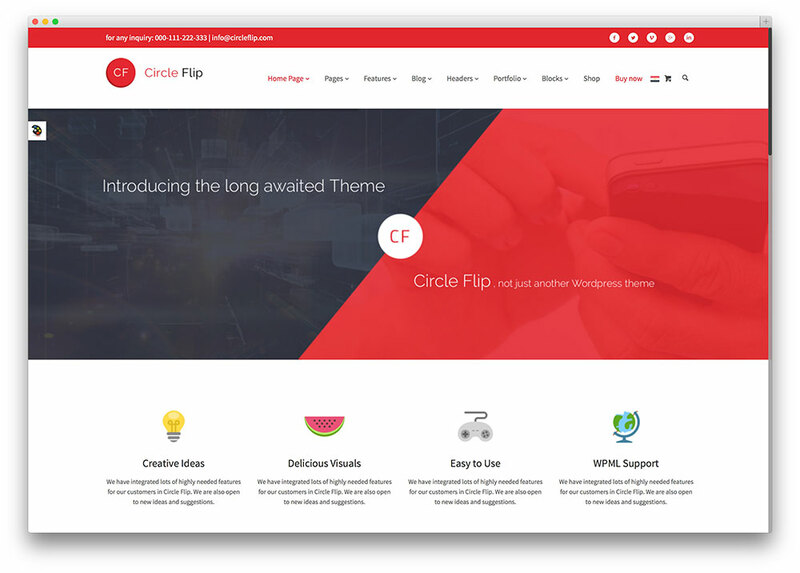 This flexible WordPress theme comes with a brilliant theme options panel that facilitates easy theme customization. The theme options panel helps you modify the framework of your blog, upload logo and favicon, select fonts, turn off responsive mode or set background color or background image with Parallax Effect. 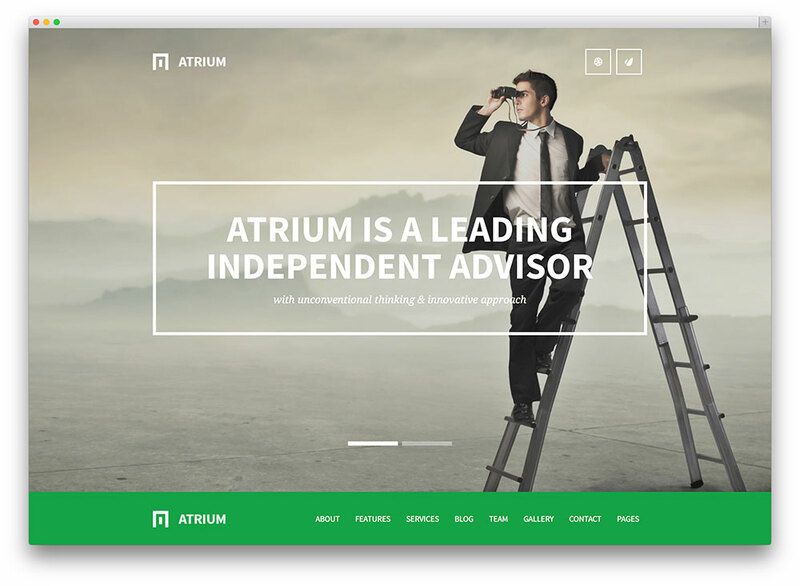 Atrium supports an isotope filterable portfolio, an excellent feature that users can exploit in highlighting their work or displaying business information in a fashionable way. 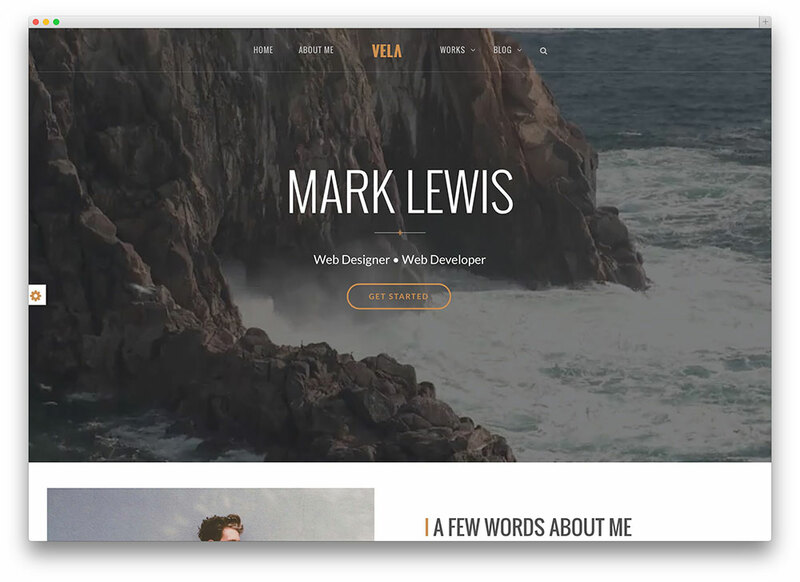 Vela is a versatile, adaptable multipurpose WordPress theme. It is great for business sites due to its astounding quality. It has a Drag & Drop page builder, allowing customers to create awesome posts and pages. You do not need to touch even a single line of code, because Vela has over 50 content elements, and they are all at your disposal. This theme has both Parallax and Full Screen sections. 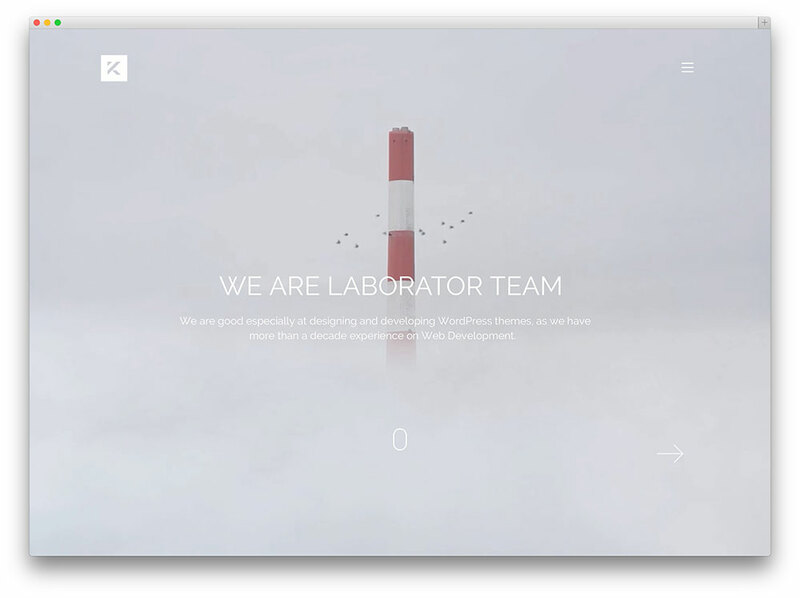 You are able to effortlessly setup a full width, full screen, color overlay, Parallax section. Use the unique theme slider to display your content. Vela also incorporates custom section mask styles. It works with the most popular browsers. With just a single click, a one page site can be established. It will generate its own anchor tags and content for the page. Never before has this task been so easy. Another nifty feature is the Ajax Live Search, displaying suggestions while the user is typing. It is similar to what can be found with most major search engines. Customers can personalize their post type, and the amount of items that can be showcased with each post variation. With Vela, your site can appear on Retina displays and mobile platforms. Regardless of what you are using to surf the web, this theme has you covered! In terms of aesthetic customization, there are several options. You can either choose some of the colors that come with the theme, or select your own eye-catching palette. 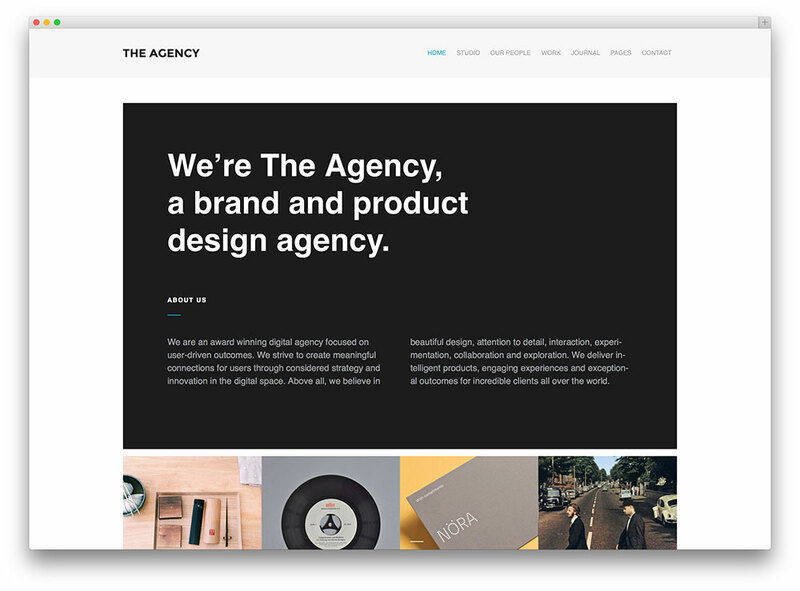 The Agency is a versatile agency theme that lets you create an inimitable web presence for your business. This trendy WordPress theme is created for artists and creative agencies who want to display and sell their works online. It is packed with awesome features and customization options that could help you set up a unique website with just few clicks. This theme is built using the latest web development practices to help you get ahead of your competitors. The theme package contains HTML, XML and PSD files, 2 custom post types and 3 widget areas to help you create a stunning website for your business in an instant. It offers unlimited colour options to suit your brand or corporate identity. It comes with a smart theme options panel that lets you edit your header design, background, favicon, fonts and many more. It has a full width slider which allows you to highlight your works and draw the attention of your target audience. It features a drop-down menu to help your visitors find the content they are looking for in a jiffy. The Agency WordPress theme is created using valid HTML5 and CSS3 code and loads really fast. Ultimately, this theme is fully responsive to provide your target audience a great user experience no matter what kind of device they prefer to use. 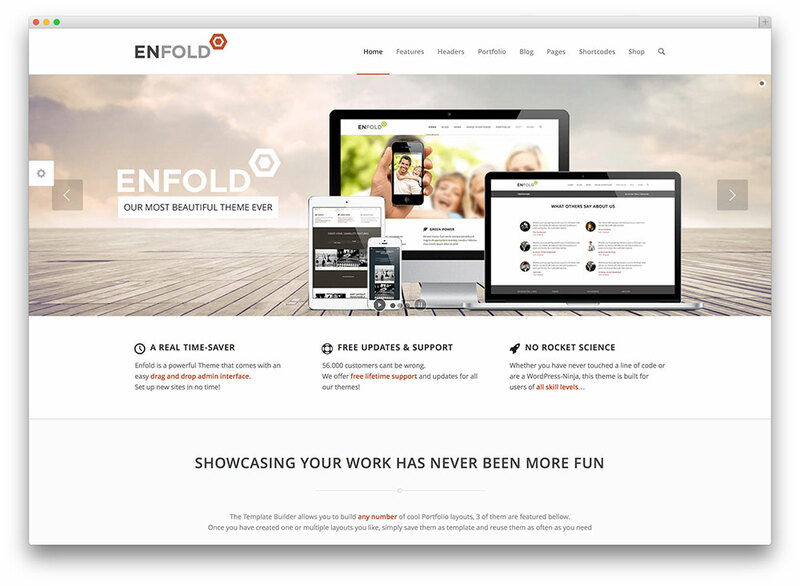 Enfold is a clean and multi-purpose WordPress business theme. Its responsive layout allows you to provide great user experience to your consumers. Enfold is ideal for business websites, shop websites, and website owners who want to flaunt their master piece on a spacious portfolio site. It includes countless theme options that allow you to edit the layout, colors and fonts straight from the admin panel. Its innovative template builder will help you create a striking website in a jiffy. Ultimately, its WooCommerce integration makes it possible for you to sell any products or services online. 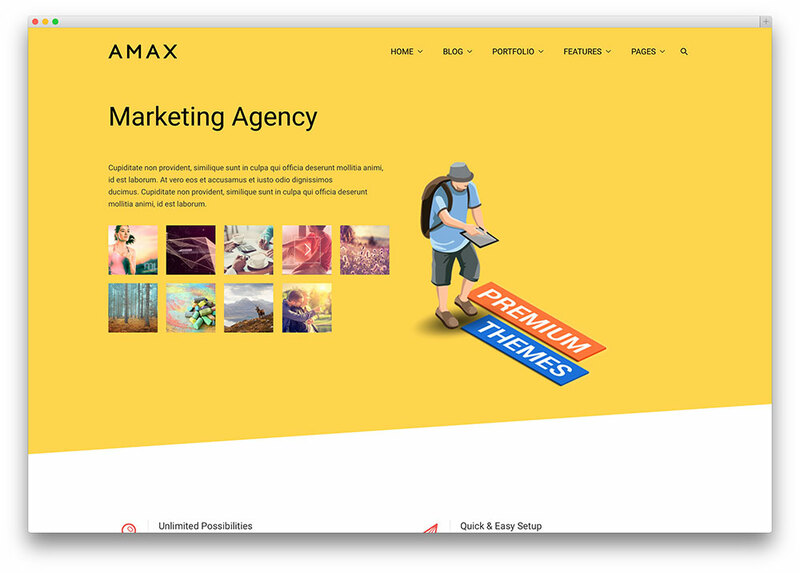 Amax is a WordPress theme that can be tailored to fit any web page. It is filled with powerful options, and a modern design that is sure to attract plenty of views. For those who are not familiar with this amazing theme, the developers have added a short theme overview video. It showcases the main theme features, and explains how Amax can enhance your site. This is a true multi-purpose product, due the integration of some very versatile tools. Regardless of your business niche, Amax can accommodate your vision. You may alter the fonts and colors of the site, while choosing from various headers, titles and page layouts. Basically, you are in control of every element. This assures that your site will be your own, and not just a carbon copy of the standard template. The built-in composer can be used to construct a limitless number of pages. If you want to bypass the construction process, you can always take advantage of demo pages. Amax incorporates a prolific video page builder plugin. Every single element is styled, and a series of additional elements were included. It is entirely responsive, capable of working on any screen, regardless of size or resolution. For more details about this theme read our detailed review. 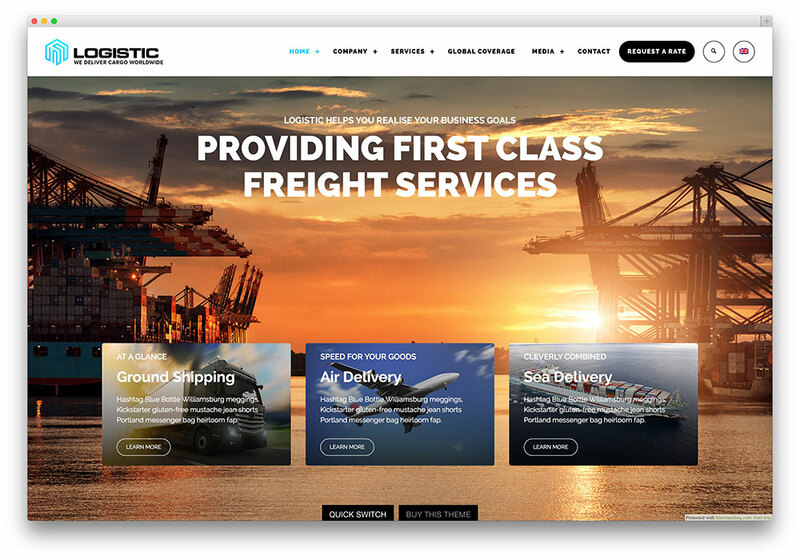 If you are looking for a nice WordPress theme that can improve your transportation company website, Logistic might be exactly what you need. It is not that difficult to set it up and navigate its options. This product includes plenty of amazing features such as web fonts, personalized components, astounding CSS3 animations and animated content. It is obvious that countless hours of development went into this theme, as the developers analyzed other successful sites and implemented their best features here. With Logistic, it’s all about the results! Its powerful yet simple layout is great for everyone. Every visitor will become a regular customer, if you play your cards right. This theme has an exquisite admin experience, and it can adapt to any business niche thanks to its massive amount of features. Most clients are very thankful for Logistic, and a majority of reviews have been positive. They appreciated the well-rounded design, and the tremendous attention to detail. If you are not an experienced user and you have some issues with your theme installation, be sure to check out the online video tutorials. This theme was developed by an elite author, and it is compatible with several major browsers: Mozilla Firefox, Apple Safari, Opera, Internet Explorer 9-11, and of course, Google Chrome. Theme Forest files were added, including: CSS, PHP, and JS files. The Documentation for this theme is very well written, and it can help users to navigate even the most troubling issues. Logistic is also fully responsive, having no trouble with resizing your website.